Last weekend Sergio and I went to grab a bite at Aquitaine’s bar. I was eyeing the burger on their menu but at the suggestion of the bartender I tried their new “Michelin Burger” (shown above), which wasn’t officially part of the menu. I ended up devouring the burger and enjoyed it so much that I asked the bartender to send me a photo if Aquitaine ended up adding it to their menu. Apparently several other patrons liked the burger too, because earlier this week I received a note from the restaurant group thanking me for coming in and letting me know that starting this weekend the burger would be added to their brunch and lunch menu as well as to their bar menu, effective this Monday. 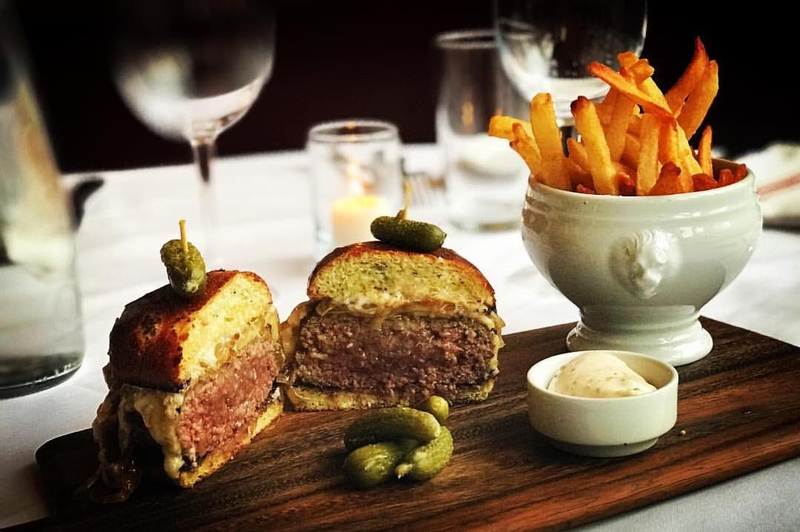 The “Michelin Burger” is made with dry aged ground beef, topped with caramelized onions, Vermont cheddar and truffle mayonaisse and served on a toasted onion roll. I opted to have my burger cooked medium rare but however you like it – I’m sure you’ll walk away both full and satisfied. This is definitely one of the best burgers in town and a must try for anyone who enjoys a hamburger. Much thanks to the bartender at Aquitaine for going the extra mile, forwarding my comments and contact information so I could get this photo. Now that dry January is over, I’ll come back and try it with a cold beer. LOL Glad you liked the burger too.. The day I was there they were playing classic 80s tunes which I really appreciated.